It was informed, Chiyaan Vikram will announce a massive update to his Instagram account today at 6 PM, and fans of Vikram have been waiting excitedly. The announcement is now made, that his son Dhruv will be launched as the hero in Kollywood with the Tamil remake of recent Telugu superhit film Arjun Reddy. Vikram posted, "Ready to make the leap. Dhruv to be Arjun Reddy #E4Entertainment." So it is now official that Arjun Reddy is going to be remade in Tamil. It is going to be interesting to see the young lad, playing Arjun Reddy's character which carries so much of swag and stylish attitude. But, now the big question is who is going to direct it? Stay tuned for more updates. The much talked about cop movie sequel, Saamy 2 starts rolling from today, 30th of September. 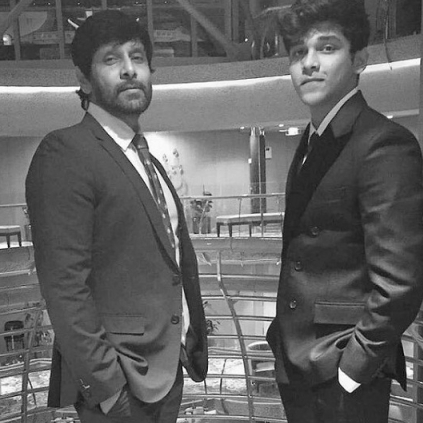 Vikram completes Dhruva Natachitram's abroad schedule and is back to start shooting for Saamy 2. He has got a new makeover for the film with a thick mustache. A photo of Vikram's new look is going viral in social media. We wish the Saamy 2 team all the very best! "Kamal Haasan knows how to win in Politics" Rajinikanth's Massive statement! Father and son Karthik and Gautham Karthik come together for a film! Bigg Boss Finale - Kamal Haasan full speech about political entry! Just in: Bigg Boss Tamil Title winner result is here! Massive: 76,76,53,065 votes cast for Bigg Boss season 1! Official: Shankar's word on Kamal's Indian 2! Gautham Karthik’s next action thriller will release soon! REDHOT: What did Oviya ask Arav? People looking for online information on Arjun Reddy, Dhruv, Vikram will find this news story useful.